I've been telling you guys I would do a MLIWW post featuring Jeansy's t-shirts and sweaters, but I think I'm going to feature each one every other week or so. He doesn't have many, so it won't last too long! ...on sale at Walmart one day. It was $1, and I had just gotten Jeans a few months before. I thought it'd be funny to put him in it once and be done with it. I didn't realize how the t-shirts and sweaters would actually help us and help Jeans. When we first got Jeans he had a lot of behavior problems. Not just normal kitten craziness, but serious issues that were so hard to deal with (as someone who hadn't been a cat owner since 8 years old) that I considered bringing him back to the Humane Society because I was at the end of my rope. He was constantly biting us, drawing blood every single time. I still have scars all over my arms! He would frantically run around our apartment and if we were sitting on the couch he would run over us and scratch us up. He also wouldn't sleep at night. He would be up biting us and running around and knocking things down every night. He was also really good at waking me up one hour before my alarm would go off, regardless of what time it was set for. I have no idea how he knew, but everyday for months on end he woke me up one hour earlier than I wanted. At that time, I was occasionally working at six in the morning, which meant I had to get up at 4:45 am, which means he woke me up at 3:45, after I probably went to sleep at midnight. It wore me down after a while! I didn't know how to cope with it. One day Chris and I went to get groceries and I picked up this sweater. When we got home and put it on him, his behavior changed instantly. He was finally calm for once. I put it on him and he instantly laid down and started purring. I didn't connect the dots for a few weeks, but eventually we started putting it on him at night so he learned that he was supposed to calm down and go to sleep. And he did! It took about six months, but I think the sweaters (along with turning from kitten to cat) really helped him learn about nighttime sleep. He barely ever has to wear anything to bed anymore. He usually climbs in bed with us when he's ready to sleep, and every night he sleeps in between our legs. We definitely had a rough start, but he's become the best little kitty I could have asked for! That is awesome! Great story! I love these wednesday posts. That little sweater is simply incredible. If i put this on my fat cat he would never forgive me. yay! This is such a cute story! Love the pics! cats are strange people! glad to hear he calmed down so much. 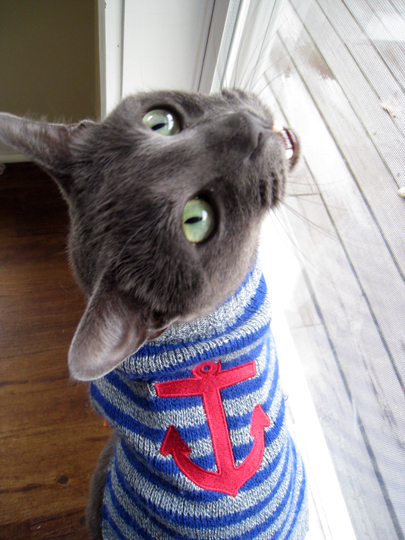 he is such a cutesy and looks adorable in his sweater. Adorable! 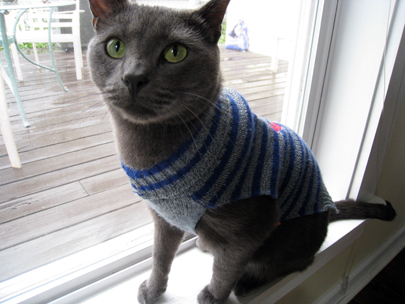 I am so glad you posted pics of him in a sweater! so cute! what a crazy cat. So just like with some children that have sensory integration delays they sometimes wear "weighted" vests. It helps ground them and gives a sensory input that is calming. And like with children that grow out of their delays by learning to listen to theirs bodies so has Jeans! I LOVE IT! 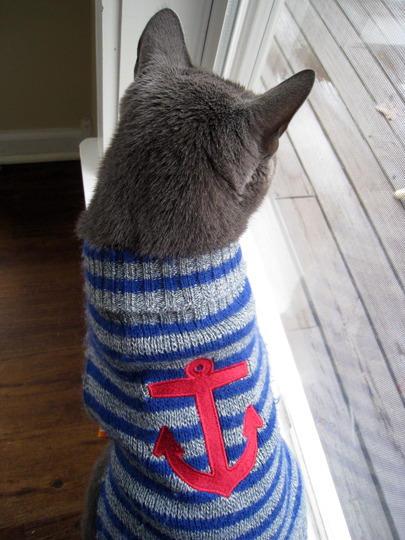 I want one for my kitty! She'd never keep it on though!